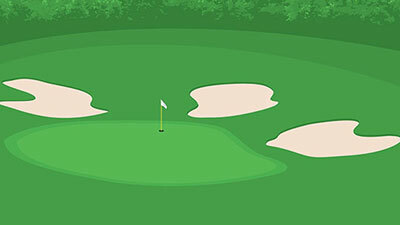 Because of its uniform appearance and ball roll, density and color, creeping bentgrass is considered the most desirable species for putting greens worldwide. Unfortunately, stress to this cool season species during summer months is one of the biggest limiting factors of its success in Virginia. Numerous things happen to the physiology of creeping bentgrass during stressful conditions, preventing many important functions from occurring. When soil temperatures rise above 86°F, bentgrass has a net energy loss, resulting in a loss of functionality of both roots and leaves. Golf course superintendents utilize various tactics to combat this. Installing turf fans is one of the many strategies. Turf fans are used on many golf courses in the Southeast and into the transition zone to provide much needed airflow in areas with poor circulation. But what is the real benefit? Do fans really cool the turf surface? Do they affect the temperature of the rootzone, which is actually more important for plant survival? Does the added airflow dry out the turf to where more water is needed to keep it alive? How do turf fans impact stress induced diseases, such as Pythium root rot? Clearly, many questions need to be answered. We know that turf fans are valuable, but how much of the putting green is actually being impacted? These were some of the uncertainties that led us to our current research. Our research is designed to answer some of the questions that remain regarding potential benefits of turf fans on golf putting greens – specifically, the spatial component associated with fan placement and the impact on the ability of secondary pathogens to further impede creeping bentgrass growth and development. The objectives of the research are to (a) determine distal benefits of turf fans on in-play golf putting greens and (b) evaluate the impact of fans on reducing Pythium root rot and other secondary disorders by improving the microenvironment. Research in 2012 looked to address some of the key response variables associated with distal benefits. During the summer of 2012, we began studying the spatial impacts of turf fans in Richmond. An oscillating 5hp Electric Turf Breeze 50″ (TB-50-Premium, by SubAir Systems, LLC) fan was installed on an in-play putting green in May, and it ran continuously throughout the summer until after all data collections. Measurements of soil and canopy temperatures, soil moisture and maximum and average wind speeds were collected on three dates in July and August. These measurements were compared with mapped georeferenced reflectance data using an online data processing service. As an objective measurement of turf quality, this type of data is often more sensitive at detecting stress than the naked eye. Air movement from the fan exceeded four miles per hour across the green, but the benefits were less apparent at greater distances from the fan. Analyzed data showed that temperatures and soil moisture increased at increasing distances from the fan base. Cooling effects were more dramatic on rootzone temperatures than on canopy temperatures (Figure 1). 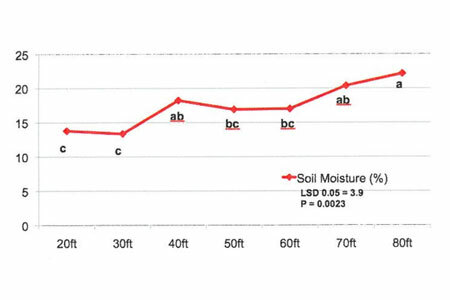 Soil moisture was reduced by approximately ten percent at distances closest to the fan (Figure 2). This is important because certain diseases are more severe in wetter soils. Reflectance gen­erated and mapped showed a distinct region closest to the fan with highest turf quality values (green), with most other areas having reduced quality (Figure 3). 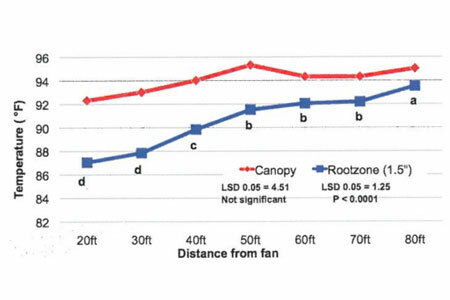 Figure 1: Rootzone and canopy temperatures at incremental distances from a stationary turf fan. Mean temperatures with the same letter are not significantly different. Figure 2: Soil moisture at incremental distances from a stationary turf fan. Mean temperatures with the same letter are not significantly different. Figure 3: Mapped reflectance data to show the spatial impact of turf fans on golf putting greens. Relative turf quality is highest inn dark green areas, followed by light green, blue, yellow and orange. 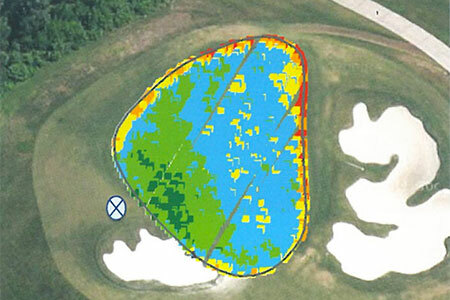 To date, our data shows a spatial impact on optimal benefits of turf fans. With one season of data, turf fans (when installed properly) appear to be a useful tool for cooling the rootzones and managing moisture content. Reflectance mapping is strongly correlated with soil measurements and can be a rapid tool for assessing how well fans are performing. Even a few degrees can make a difference in the physiological response of creeping bentgrass and annual bluegrass. Not only will the turf be able to function more properly, fungicide performance should also be maximized. This ultimately should result in fewer applications needed throughout the summertime. Research efforts in 2013 will focus on fan initiation timing and ultimate impact on Pythium root rot, a difficult to control disease during peak summer stress.